Enjoy low, discounted prices on a wide selection of products including electricals, beauty products, fashion and more. Find great deals on all types of home and kitchen equipment including pots, pans, cleaning systems, small appliances, vacuum cleaners and more from trusted brands like Nutri bullet, Pressure King Pro, new Image and more. Spruce up your outside space and complete all thos DIY jobs around the house with these great offers on cleaning tools, hoses, router sets, hand tools, compressors and much more from great brands like TacLight, XHose, AirHawk and more. Where do I use my High Street TV voucher code? Add the products you wish to purchase to your shopping bag. Go to the shopping bag page by clicking the bag icon located in the top right-hand corner of the page. Below your order summary, you will find ‘Apply promo code’. Click the text and you will reveal a drop-down box. Enter your code here and click ‘Apply Discount’. You order total will automatically be updated with any discounts. Find big savings of up to 60% in the Clearance Section. Hear first about discount codes and special offers by signing up to the newsletter. High Street TV, is one of the most successful Multi-Channel retailers in the UK. It has four 24-hour dedicated shopping channels on SKY and Freesat in addition to advertising on over 50 digital TV channels in the UK & Ireland including ITV and Channel Four and Five. Their products are stocked in over 5,000 retail outlets, including Argos, John Lewis, Selfridges, major supermarkets and high street retailers. Their website offers a huge range of products from beauty and fashion to home accessories and much more. Whether you are looking for fashion and footwear, health and fitness products, kids toys or homewares, you will find some great bargains at High Street TV - who occasionally also offer a discount code, giving you even better value for money. Also, check out their clearance section for some seriously discounted products. You will find the Wonder Core 2 on the High Street TV website. Wonder Core 2 is more than simply a workout for your ab. It boasts a built-in rowing attachment, so it’s a 12-in-1, muscle-toning system which will help you to achieve the total body results you want without having to go to the gym. With High Street TVs Flexi Pay facility, you can opt to pay for your Wonder Core in 3 instalments, so you won't have to wait to get started on your exercise regime. If a Pressure King Pro is what you need then look no further than the High Street TV website. Here you'll find the 8 in 1, 12 in 1 and 20 in 1 versions of the Pressure King Pro, which enables you to cook fabulous meals at the touch of a button and up to 90% faster than with traditional cooking methods. It’s also a much healthier way to cook, as it locks in more vitamins and nutrients than boiling or steaming. Whatever size of family you are cooking for, High Street TV has the Pressure King Pro to suit your needs. Am I able to track my delivery? Yes, you will be given a tracking link in your dispatch confirmation email. This can usually be used from 9pm on the day of dispatch. Am I able to ship to a different address from my billing address? Yes, there is an option to fill in a separate delivery address from your billing address at the checkout stage. If you wish to return an item, you must do this within 30 days of receipt. For the full returns policy and detailed information on how to return an order, please click here. High Street TV was established in 2008 and can be found online, on Sky TV plus on over 50 other digital TV channels and in major high street stores such as John Lewis and Argos. Use our High Street TV Promo Codes to bag yourself an amazing deal on a wide range of products at low prices. 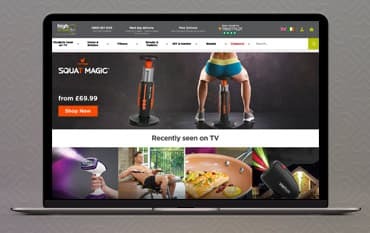 High Street TV is the place to shop for fantastic 'As Seen on TV' kitchen, home, small domestic appliances, DIY, garden, fashion, fitness items and much more. Not only do they sell their own branded products such as the Pressure King Pro, YAWN air bed and Verti Steam Pro, you can find great deals on top brands such as NutriBullet and XHose. With extra deals available online such as free delivery on selected items and up to 50% off in the clearance section, you are sure to find a bargain at High Street TV. We are constantly on the hunt for first order Promo Codes for High Street TV to help you with your money saving. Our experts check dozens of sites for secret codes including NHS discounts, student sites & social media channels saving you time & money!